One of the more entertaining old dogs on a last hurrah movies. 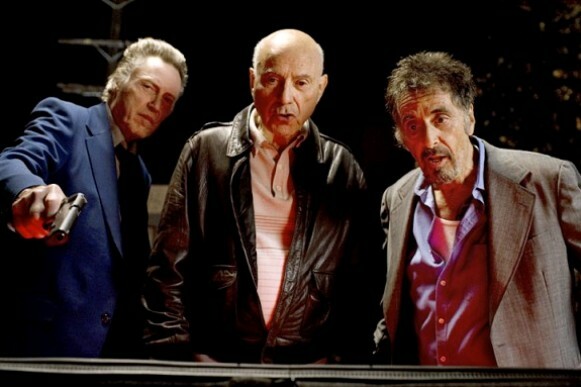 Stand Up Guys is a perfect vehicle for Al Pacino, Christopher Walken and Alan Arkin that reminds us why they have been so good over the years. They share an all-night odyssey that doesn’t tire, and there are a surprising number of hooks that keeps the screenplay’s motors running. Fisher Stevens, the once unbearably dorky actor, is a surprisingly refined director who seems to know how to grease his actors’ wheels. The credit sequence opens with Val’s (Pacino) last day in prison. The movie doesn’t say at first how much time he’s served, or for what, but the implication is that it has been a long time. At the gates, his old crime partner Doc (Walken) is waiting for him. A brief stop takes them to Doc’s apartment. It is revealed to us only, that Doc has orders to execute Val immediately. On a subsequent phone call, Doc gets an extension until 10 a.m. the following morning so he can give his pal one last party. The two revel in pharmacy theft, a wild tumble at a brothel, some dancing with chicks, some snorting of crushed prescription drugs, and following a hospital visit to stymie the Viagra overdose… the real larceny begins. With all this fun, they abscond third guy Hirsch (Arkin) from an old folks home who turns out to be the ultimate stunt driver. When they have two cops on their tail looking to pull them over for reckless driving, Hirsch assures that he can lose them. What’s vitalizing about the scene is how convincingly done it is. Hirsh’s getaway skills are masterful. The movie isn’t all crime softball, though. The screenplay by Noah Haidle works in some hard-bitten circumstances involving a few female characters (one a damaged woman craving revenge, one a pure waitress of enviable patience). For these guys, caring for these women is like a last stand diversion towards the 10 a.m. inevitable. Caring for female characters, let’s face it, is a nostalgia act. The final outcome is arguably predictable, depending on your experience with the hitman genre. But it’s the flair for character demonstrated that counts. Pacino treats the movie as if it were a final performance. Walken treats the movie as if he just got awakened from the dead and was finally given a good role again. Arkin does his slyest relief work, especially when shacking up a three-way with Lucy Punch (as the brothel madam) and Katheryn Winnick (as the brothel’s best Russian girl). 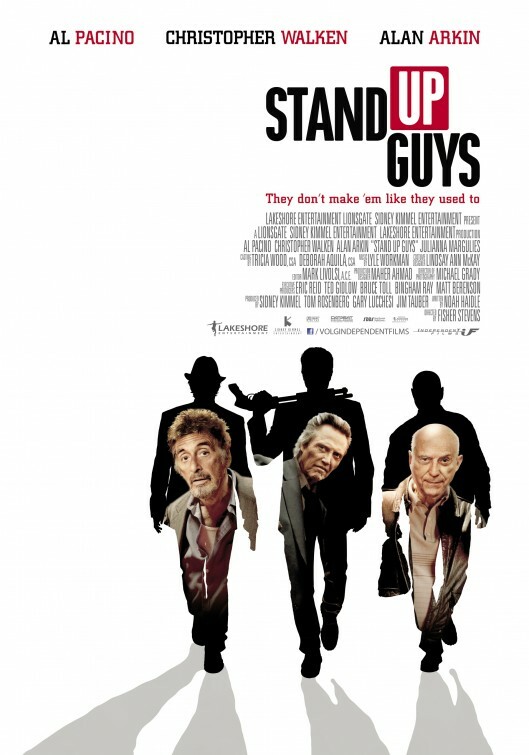 “Stand Up Guys” is simply a throwback star-studded entertainment. Film Cousins: “Mikey and Nicky” (1976); “The Killing of a Chinese Bookie” (1976); “Buddy Buddy” (1981); “The Crew” (2000).